My husband was channel surfing the other night, something he's very good at, and came across an episode of Food 911 where Tyler Florence was cooking Tagliatelle Bolognese. Intrigued by what he saw he asked me to track down the recipe on the Food Network's web page. That's one nice think about the Food Network; if you can remember even the smallest detail about the show you can usually track down the recipes online. 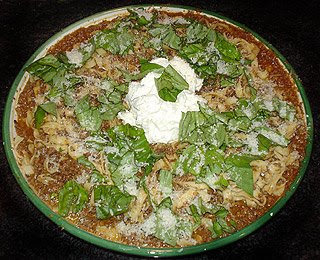 Bolognese is a meat based ragu typically made with several different meats and very little tomato product. Every chef seems to have their own recipe for bolognese; varying the type and amount of meat and tomatoes used. The only constant in these recipes seems to be the sofrito, which is a sauteed mixture of onion, celery, carrot and garlic. This past week my cousin Marie was visiting us from NJ. So we gathered the family together for an Italian dinner at our house. My husband and I decided to give Tyler's Tagliatelle Bolognese recipe a try. Tagliatelle are long flat pasta ribbons that are about 1/4 inch wide. Normally we would have made fresh tagliatelle but we were kind of pressed for time. Instead we found a nice dry tagliatelle alternative at our local AJ's. This is my contribution to the "Festa Italiana" celebration hosted by Maryann of Finding La Dolce Vita and Marie of Proud Italian Cook. Theresa, This is a great dish to bring to our Festa, thanks so much for joining us, this will be a perfect addition! What a lovely photo of what is surely a delicious bolognese!